Happy Monday! I hope you had a good weekend! We had beautiful weather this weekend - on Saturday it was a bit windy but today? Today was perfect. 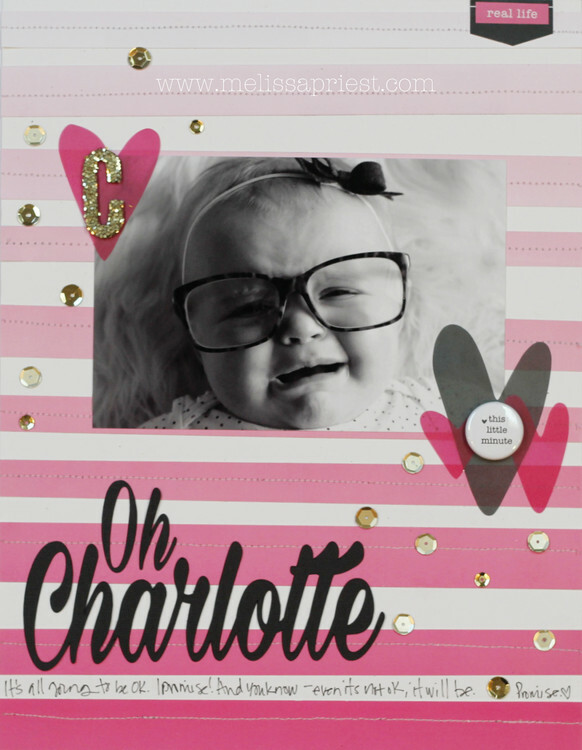 I wanted to share a layout that I made using the Felicity Jane Susie scrapbook kit. I really loved the FJ Susie kit! Pink, blue, green and black made for a great color scheme to work with. So fresh and pretty! The journaling reads: Oh Charlotte. Its all going to be ok. I promise! And you know - even if its not ok, it will be. Promise! I just love this photo. Charlotte is the baby of one of my best friends. This little girl has personality like I've never seen! Everything on this layout is from Felicity Jane's Susie kit. I cut out the title using black Bazzill cardstock and my Silhouette machine. All together, this layout came together in about 30 minuets, sewing included. We have a busy week this week - going to (hopefully) finish up the bathroom renovations for the boys bath. All that is left is painting the top 1/3 of the walls and the ceiling. You know, the fun part...or not. Have a great week friends! I will be back later this week with a page from my art journal.